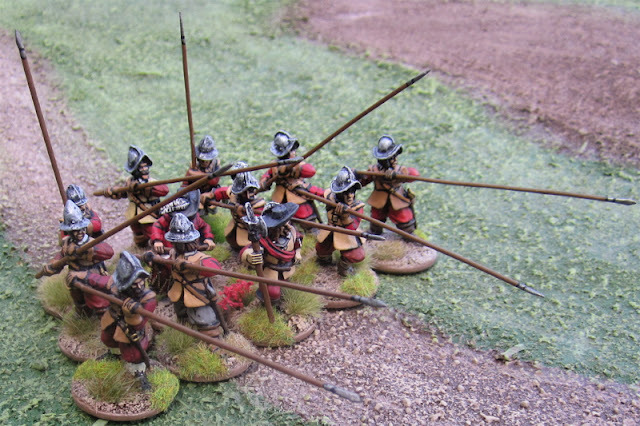 We finally got in a game of The Pikeman’s Lament earlier today. I’ve been planning this game for a while, but never found the time to get it on the table. 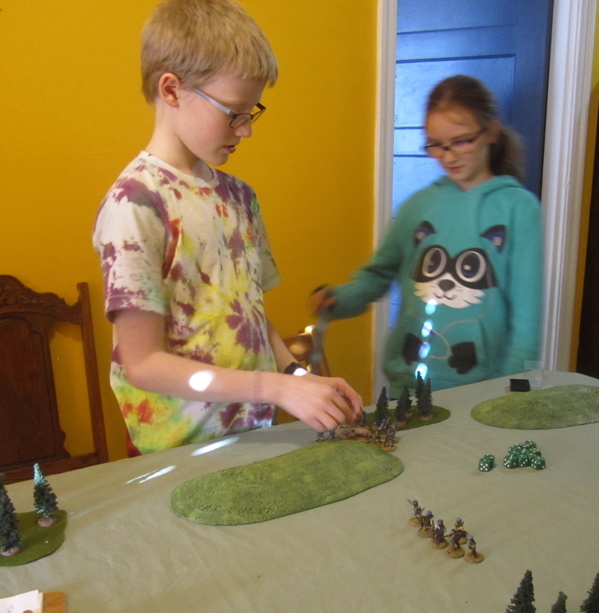 The kids had a frined over for the day and so in the afternoon I set it up for them to play. 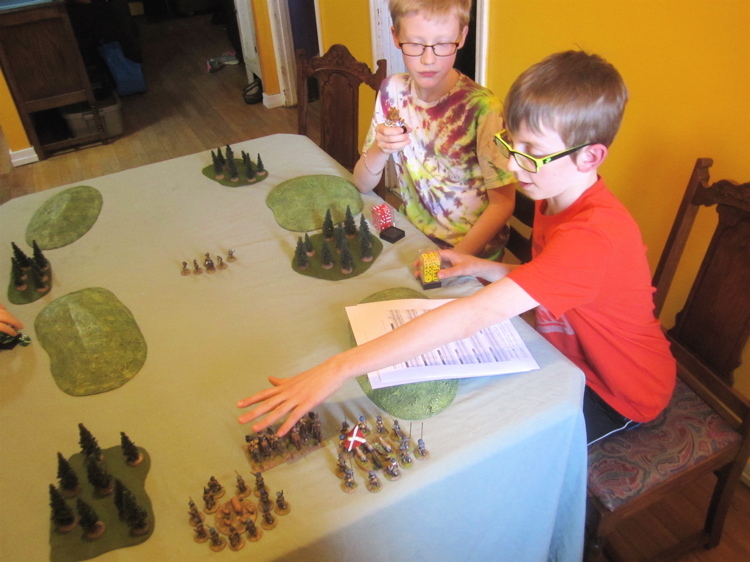 I began with reviewing some English Civil War history with the kids. I was pleased that The Girl at least remembered the kings and queens from Henry VIII to Charles I – including the relationship between Elizabeth and James I/VI (even if she couldn’t recall the events that precipitated the civil Wars… I cut her some slack, she is only 10...). It is spring of 1643 and a Royalist uprising has begun in Scotland under Marquis of Huntly who had seized Aberdeen. Earlier this year The Scottish government sent an army south – 20,000 strong - under the Earl of Leven. 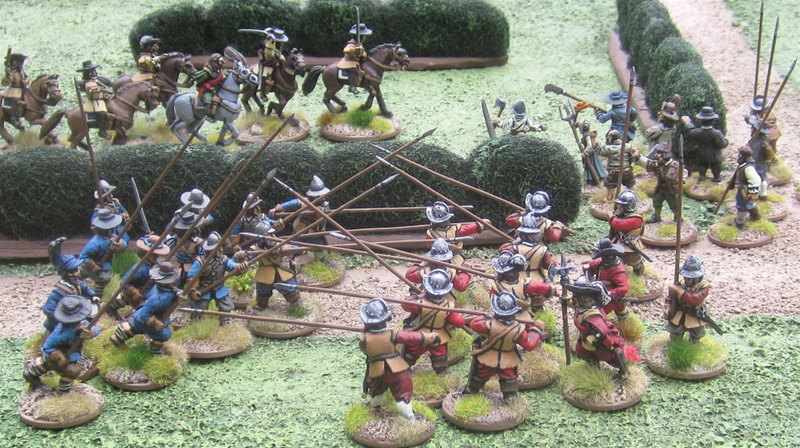 The uprising is largely in an effort to draw some pressure off the Royalists down south in England. That is until a yonng Ensign names Evan “Holy” MacErrol (a dour Covenanter and son of an even dourer Calvinist Presbyterian preacher who was murdered by Englishmen during the Bishops War backing 1638 – with a hatred for the English and anyone who would support their king) was tasked with procuring some victuals for the regiment. MacErrol Drew up a troop of horse and some foot soldiers and wandered off to a nearby village to procure some sheep and pigs… Surely the locals would understand that their cause was just and sanctioned by god himself and would gladly hand over the foodstuffs needed… and if they didn’t… well… That’s why they brought along all the pikes and muskets. When Robert MacRame got wind that some preachy lowlander had made off with HIS prized piggy and a handful of sheep, he quickly gathered up a few of this fathers men and set off to head off the band of brigands and get back their livestock – or be well paid for them! 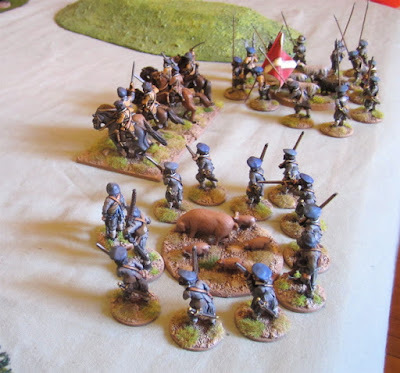 This is essentially Mission F: Steak on the Hoof – straight out of the The Pikeman’s Lament - except with smaller forces and with pigs and sheep instead of cows, and fewer of them – because our forces were smaller than the suggested 24 points. Finnegan and The Girl sit down as I finish sorting things out. Finnegan and The Other Boy decided to play the Scots Government Forces. 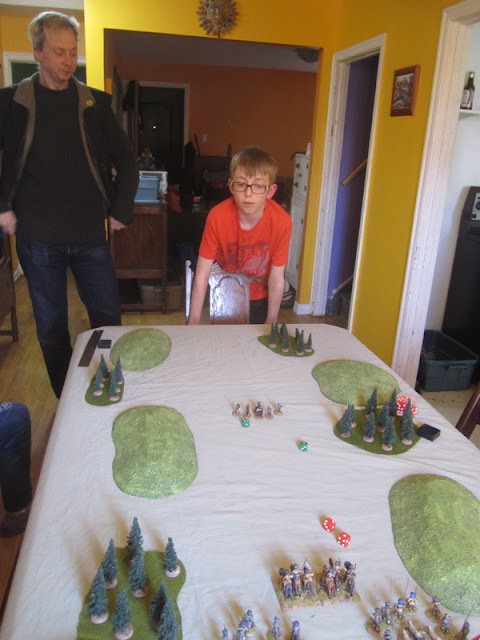 The Other Boy laid claim to “Holy” MacErrol and his Horsemen and Finnegan was to play the Foot troops escorting the livestock. The Government forces led by Evan “Holy” MacErrol. The Scottish Government Forces went first. This time MacErrol would have none of it – he unleashed some fire and brimstone at the newly recruited footmen – promising to burn all their mothers and sisters and wives as witches if they didn’t get a move on! 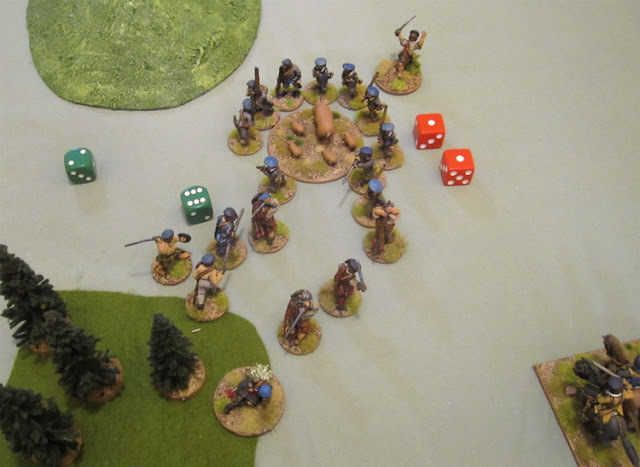 So the Pike and the Shot shuffled forward… but MacErrol himself failed to move… busy yelling at the foot shouting commands and such. On the Rebels end of the Turn both the McRowaves and the MacRopods showed up on the table and Robert’s crew unleashed a volley of musket shot and arrows at MacErrol’s Horse and took one down! 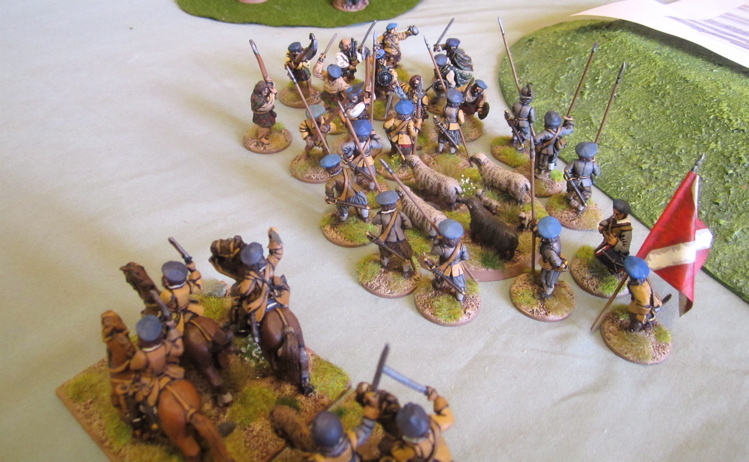 Reeling at the loss of their first comrade in this “War Without Enemie” the Horse stood again – as did the Pike. 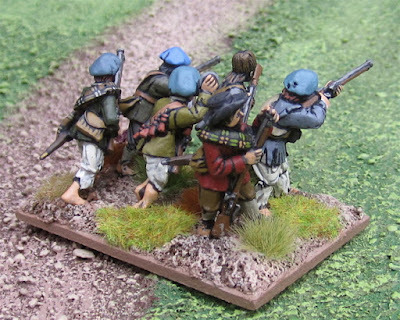 At least the Shot got a move on, but perhaps they were inspired to advance by the menacing sound of Highlanders advancing through the wood ot their rear and they were very worried about being surrounded! 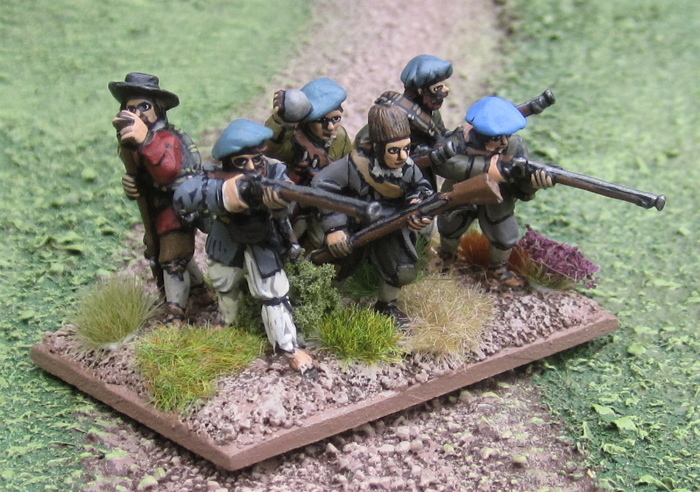 Unfortunately they didn’t advance far enough – those Highanders came screaming out of the woods and charged at them! The Scots Government Shot unleashed a volley at them at point blank range and damned near took half them down! 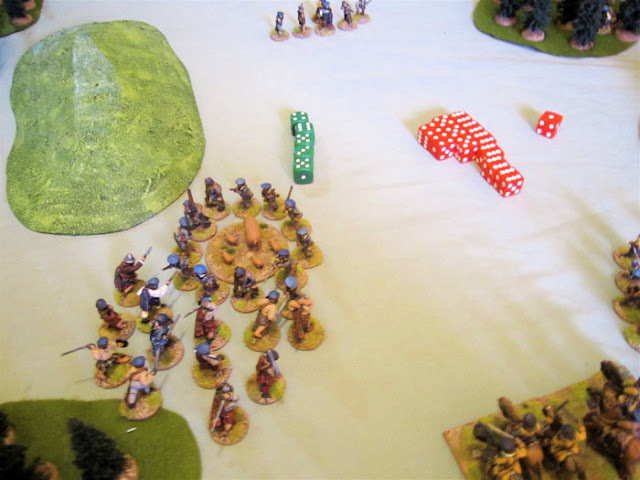 Both units were Stamina 2 – the Highlanders scored five hits, causing two casualties, but the Shot scored ELEVEN hits – taking out FIVE in ONE TURN!? The Clansmen flee back into the woods. Elsewhere the McRowaves moved up to the front edge of the woods to get a better view of the situation, and MacRame and his thugs took shots at the Government Shot and killed two more of them – causing another morale test… which they passed, somehow… but I think it was mostly because they were too confused at this point to be scared anymore…? The Horse and the Pike both advanced. The Pike managed to advance far enough that it triggered the other Clansmen’s Wild Charge, who came tearing out of the woods! … but both parties again fled!? The Government Shot, having seen the tail end of their assailants flee over the hills, decided to head back and gather up the piggies once more and head the far way around the hills – and out of the line of fire of those murderous bastards in kilts! 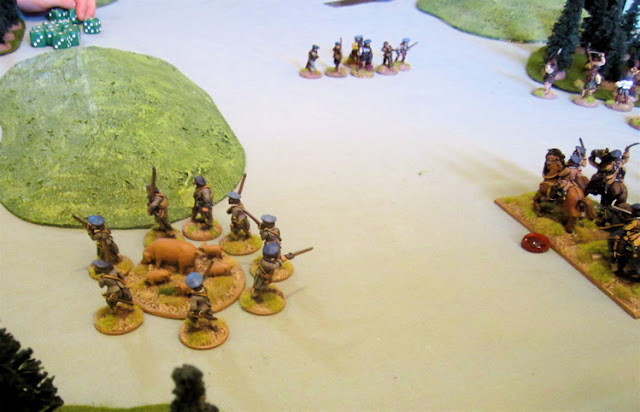 “Holy” MacErrol decided it was time his troop entered the fight – he successfully issued a Caracole order – 7+ The unit made a half move followed by a shot at MacRame and his thugs. 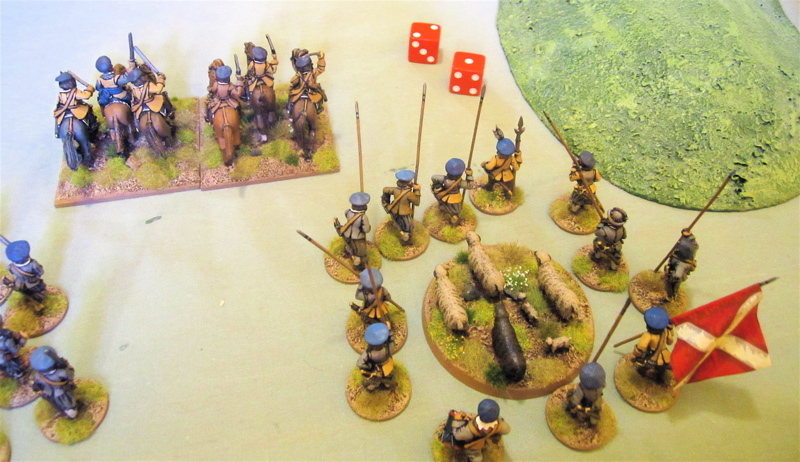 If any casualties were caused they the failed the subsequent morale test, MacErrols Trotters would them be allowed a Free Attack – if they could cover the distance with a single move! 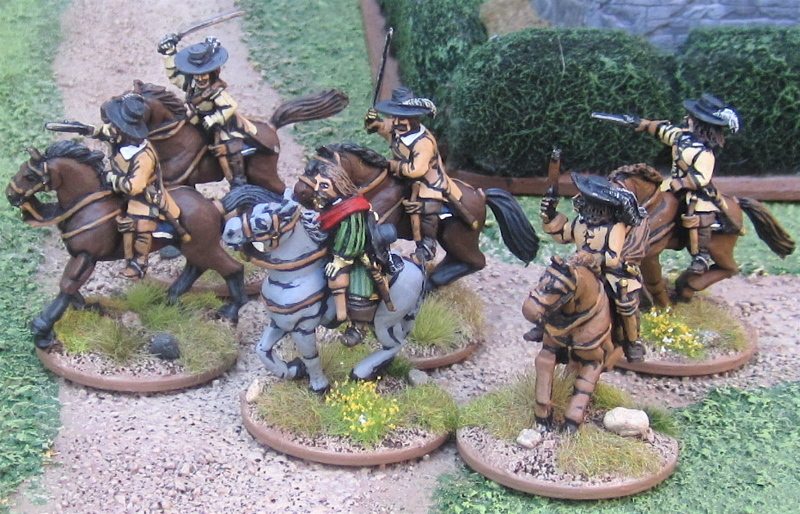 Well MacErrols horse trotted up and unleashed a mighty volley in the faces of MacRame and his men… and when the smoke cleared… Every last one of them was still standing – burnt and blacked by a bit of burnt powder, but otherwise untouched!? Had they forgotten to load bullets?! 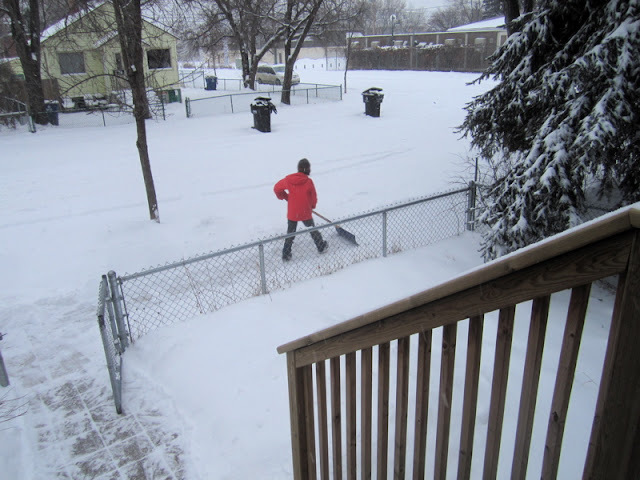 Well… so much for THAT fancy-schmansy “special maneuver”!? 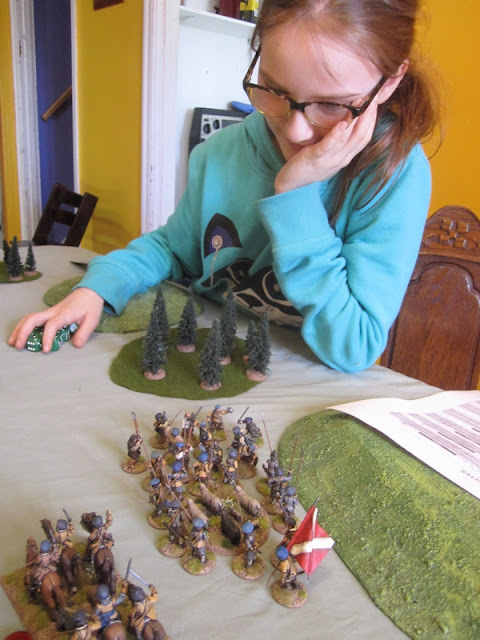 The Clansmen rallied on The Girl’s turn. The MacRame and his men fired back! 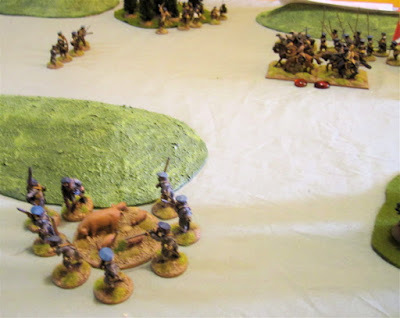 Down went another of MacErrol’s horse – and that was just too much for his men – they turned and fled from the Highland scum. Their flight was not long or far, MacErrol quickly got them under control and wheeled about. The Shot continued to make their way around the hill – hoping no one would notice their absence. 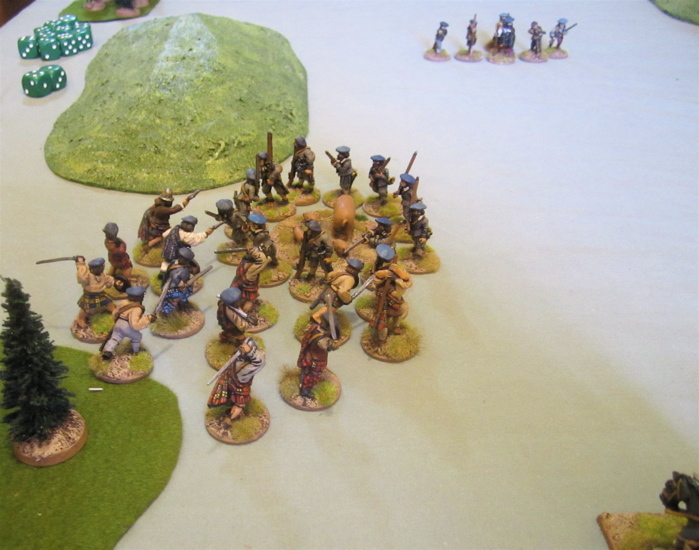 The Clansmen did not fail… a second Wild Charge brought them, once again, into contact with the Pike. 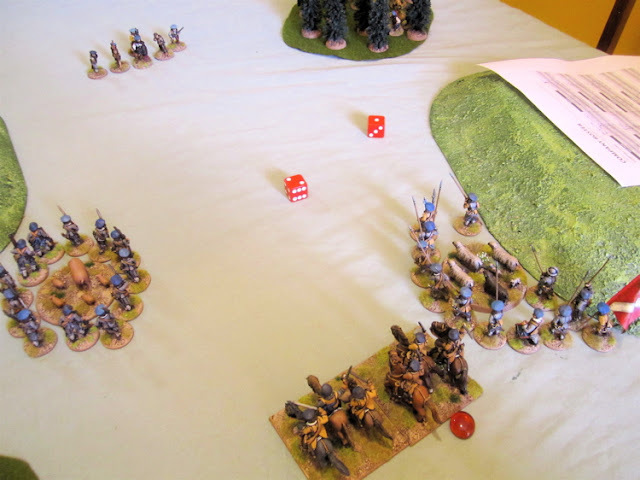 This time they faired slightly better, knocking out three of the Pikemen while losing only two of their own. The Pikemen, once again, lost their nerve and ran – but the Clansmen held their ground this time. MacRame and his men were too busy laughing and hurling insults at MacErrol and his men to bother doing anything this turn. 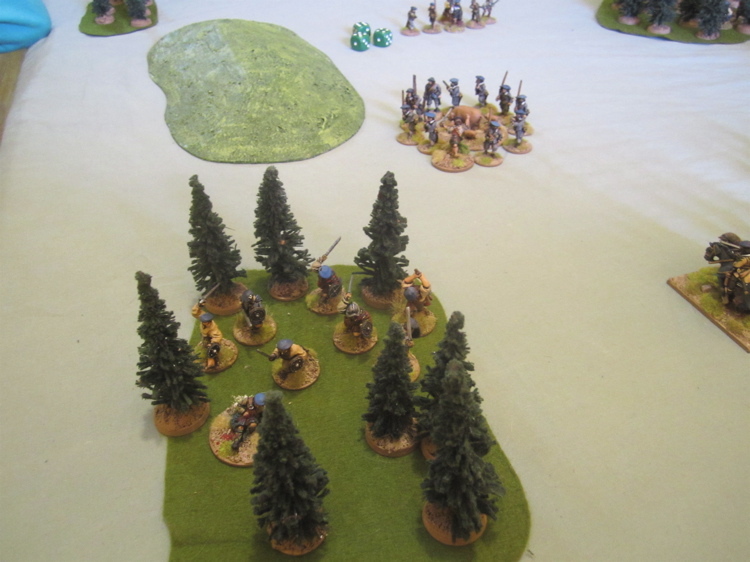 The Pike failed to rally, lost another man, and continued their retreat. The Shot continued to sneak around the hill. 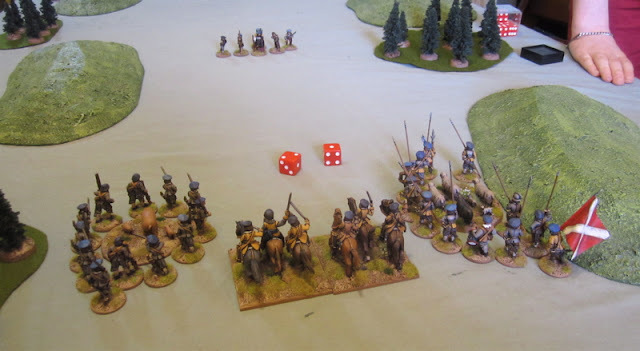 I made no note of what MacErrols horse did… they had rallied the previous turn… I think perhaps they took ineffective shots at the Highlanders adjacent to them…? 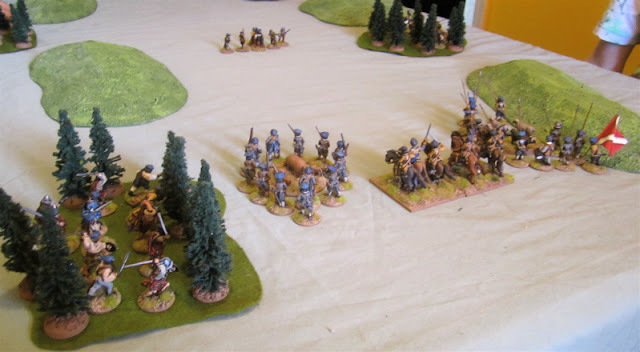 Then the Highlanders charged the Horse! 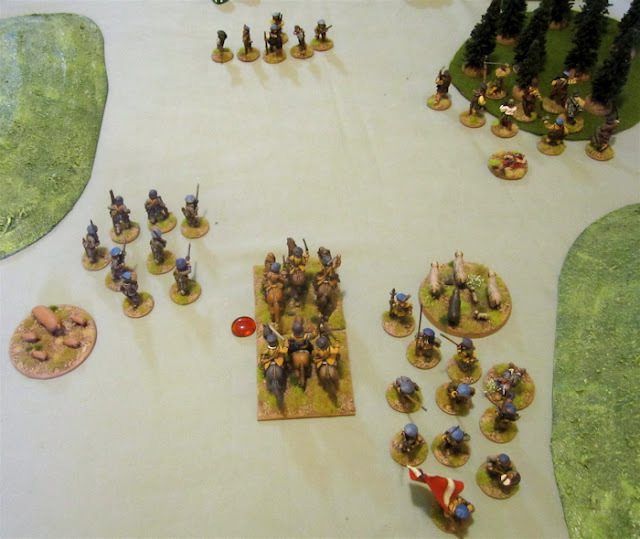 In the clash, the Highlander brought down two more horsemen – including MacErrol himself! This precipitated a bit of a rout! 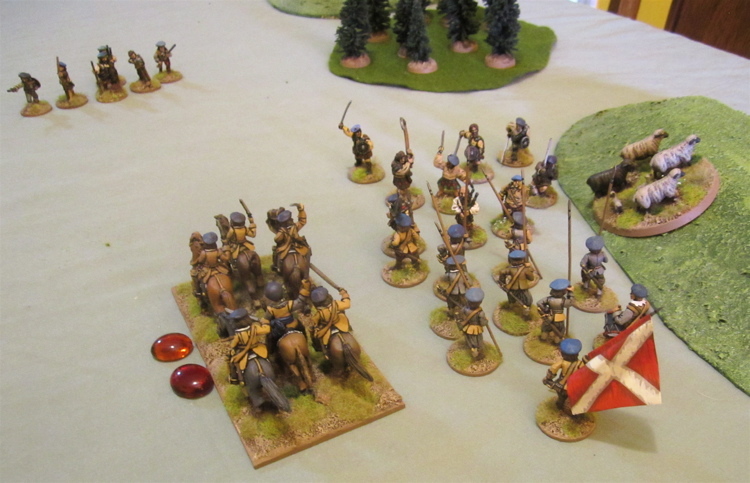 The remaining horse and Pike fled the field. But so did McRowave’s men, they’d taken three more casualties – leaving only four of their original number and with the horse and Pike in flight, they too decided to call it a day – MacRame could bloody well collect up his own precious sheep! But MacRame had other problems – the Government Shot that were making off with his piggies!! The Shot continued their flight with the Piggies! MacRame turned to fire as they poked out from behind the hill to make their way around a small wood – rather than get slowed up trying to make their way through. MacRames men scored two hits, but as the majority of the Shot were still under the cover of the hill they claimed cover increasing their Stamina to three – which meant no casualties! 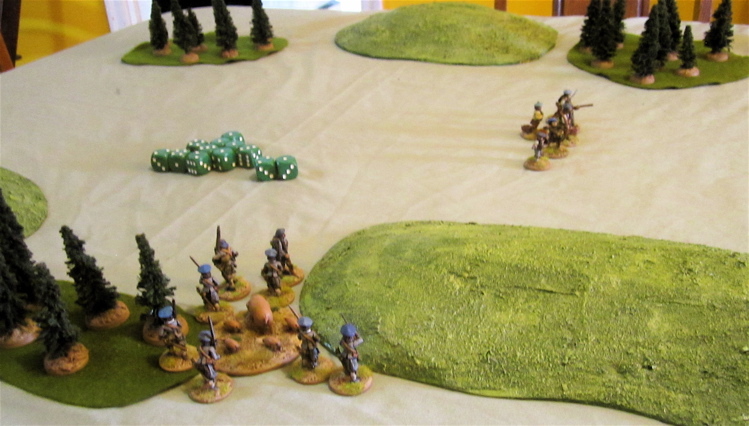 The Shot ran and MacRame gave chase – lest they disappear out of sight and/or range! Luckily the Forlorn Hope move a little faster than the Shot – giving them a SLIGHT Hope of catching them. 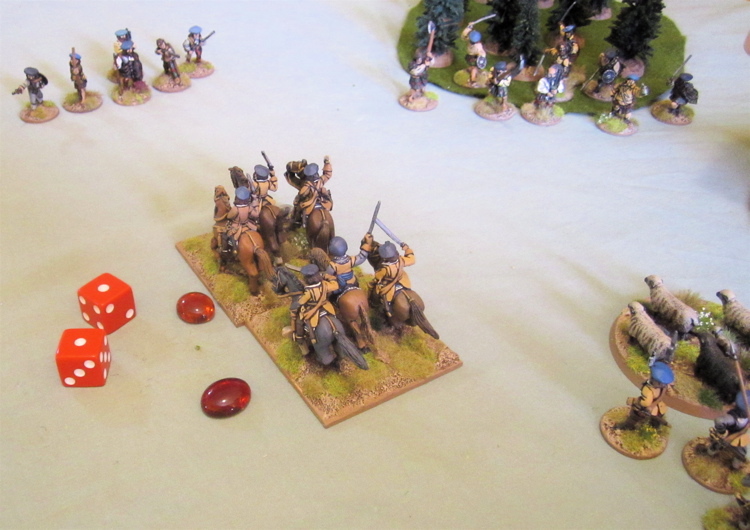 The Shot fled, the MacRames got in a parting shot, causing one casualty – but the Shot passed their morale test. The shot ran and the MacRames game chase hoping the shot might fail their orders the next turn, giving them a chance for one more shot at them. So Robert MacRame had to console himself with having at least recovered his sheep. The game was a draw – both sides made off with one group of livestock scoring 2 Victory Points each. 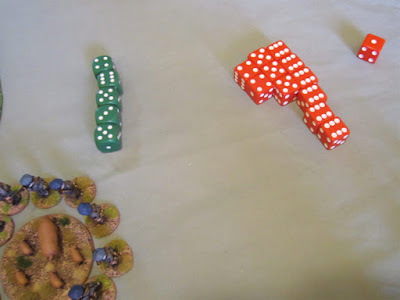 The scenario called for three groups of Livestock – which would have guaranteed a winner as the victory points would not have been able to be split evenly, but the scenario also assumed 24 points (which would have meant twice as many units) so I only had two. I also didn’t bother with Bonus Honour gaining Special Orders for this game. Fantastic game! 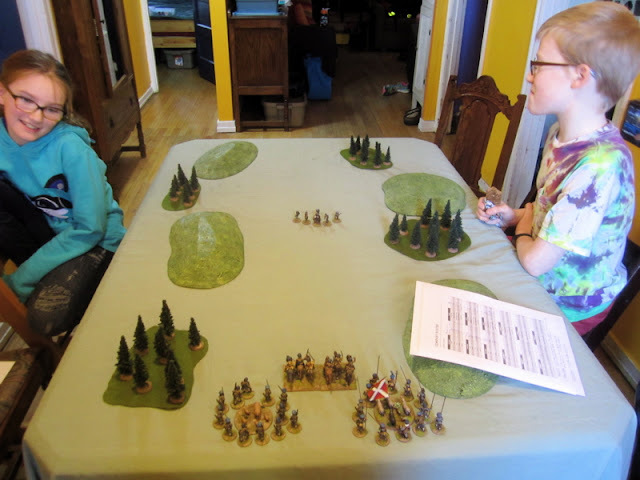 Can’t wait to get it back on the table again. 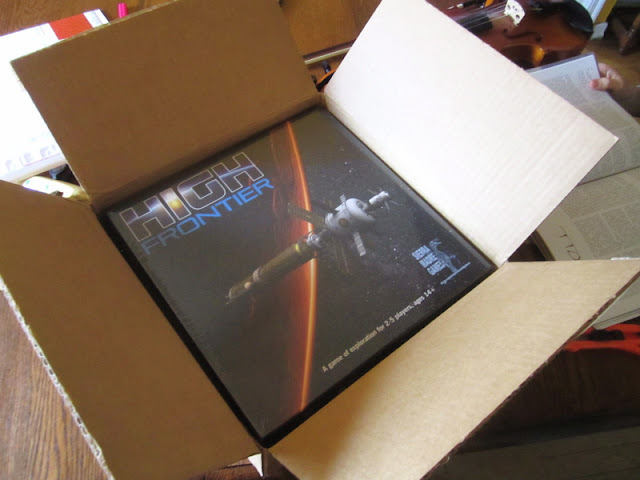 Tomorrow we’re going to try out High Frontier - I’d best get READING THE RULES!! First a truck brought by this parcel! Almost two years ago I Kickstarted High Frontier Third Edition. A friend had highly recommended the game - having played a previous edition (2nd, I think ) - but when I sought out said edition they seemed to be selling for $200-300... or that's what people were ASKING for them, I have no idea if anyone would ever PAY that much... So when a kickstarter came along for a new edition that, including shipping, would end up costing me less than $100, I jumped right on board. It originally listed the estimated delivery as September 2015... I guessed they must have had everything completed and all their ducks in a row to print and distribute... Not so much, I guessed wrong. I started to wonder if it would EVER show up. But it has. And I'm super excited to try it out - I LOVE games by Phil Eklund (LOVE, not like, LOVE!). It is a beast - I'm sure the box and it's contents was over 5Kg, and the rules look... well... very "in depth"...? We're going to try and have a go at it this weekend. 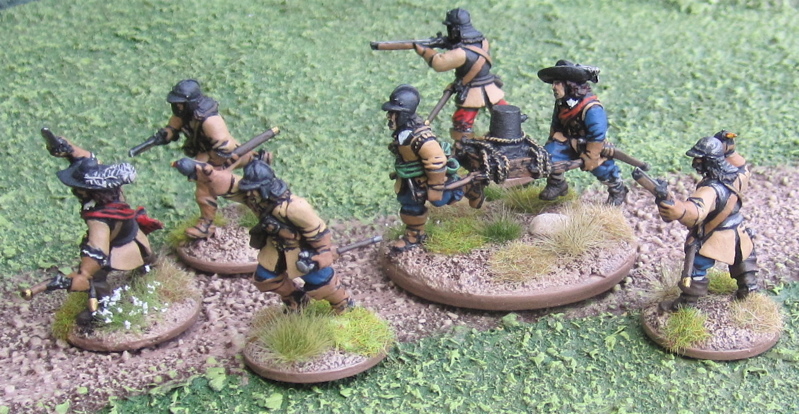 This included orders from Perry Miniatures, Eureka Miniatures USA, and Black Hat Miniatures. From Perry I got some Musketeers to finish up a few units of Shot for The Pikeman's Lament, three heavy cavalry (two to complete an element of Kn for DBA-x army and another to finish another unit for The Pikeman's lament) and some ECW Casualties for morale failure markers. From Eureka I picked up some of Montrose's Irish - a unit of Pike and a unit of Shot as well as a couple of preachers and James Graham (Marquis of Montrose) himself (on foot!). 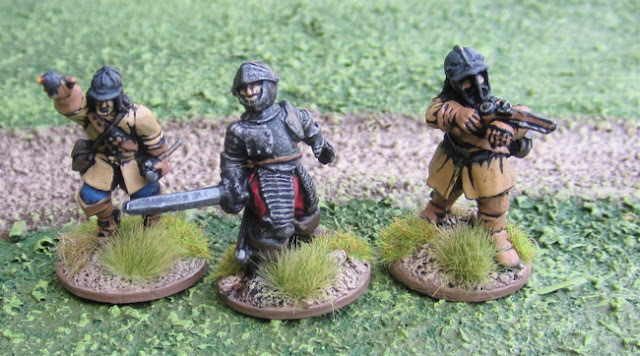 From Black Hat I got some Dwarvish Highlanders to finish up a few units for Dragon Rampant. I'm still waiting on a few orders from my post birthday spree. 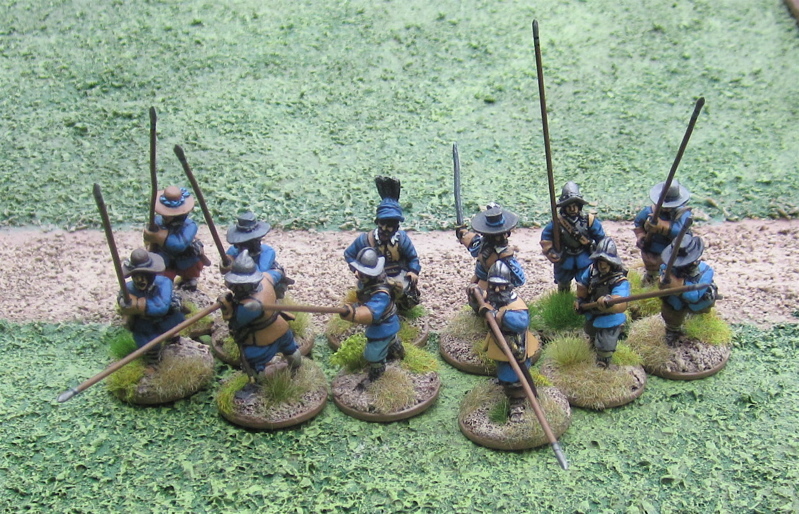 I ordered some MORE English musketeers as well as some Scots Musketeers and Pike from Dixon Miniatures. 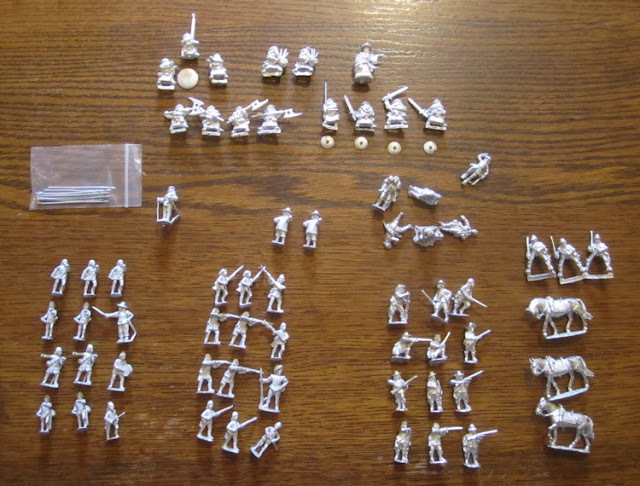 I ordered some Winter of '79 miniatures from Miniature Figures (to go with some Mike Bravo Miniatures State of Emergency figures, which I crowdfunded last year and have also now finally shipped - and will hopefully be here SOON!). I ordered an additional pack of Irish Pike and a mounted version of James Graham from Warlord Games while they had a free worldwide shipping deal on. And finally I'm expecting some Dragoons and armed civilians from Redoubt Enterprises. Oh and I also found out this morning that the creators of the Jet Bike Construction Kit Kickstarter just shipped out rewards to Backer #100 (they've been casting and shipping them out in order of backer number since the campaign ended). I'm #108! So hopefully I'll be seeing those pretty soon - sooner than then expected shipping date of June! In other news... In addition to basing and priming all these new arrivals I've been desperately trying to finish up this Polar Lights Lost in Space Robot for a friend that I've been sitting on half-fisnished for FAR TOO LONG! 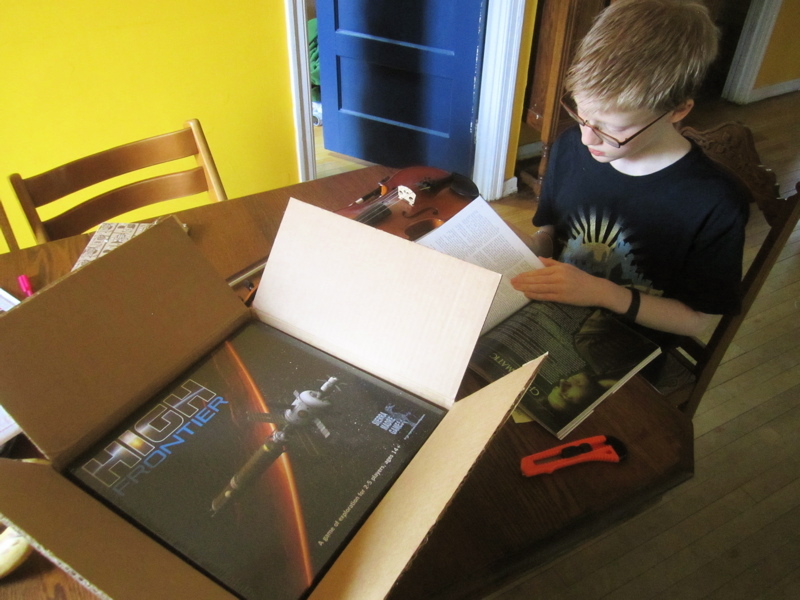 He's been waiting for this longer than I had to wait for my High Frontier Kickstarter... I painted The Mummy for him a while back... I still have two more to do... I am going to finish them before the end of the year! Pics of the finished Robot!? Giving it a little thought I decided that rather than a rich merchant, his father could be the head of a minor clan: The MacRames of Glen Dunny! He does cut a dashing figure, does he not? Unfortunately, he’s a bit of an unscrupulous cad. Being the third son, Robert is not likely to inherit. All will go to his older bother James. His father and brother have very high ideals about honour and family and expect that Robert should always stand by his brother’s side. Robert bristles under leadership of his eldest brother James and is determined to make his own way – he is always scheming and looking for a way to make a great deal of money with very little effort on his part - much to the chagrin of his father. His father says his shady deals bring dishonour to the family name, but Robert cares not. He is determined to set himself up as a self-made laird. Robert has gathered around him a gang of loyal toadies and thugs. There are his two younger brothers; Jock and Willy, who also despise their eldest brother. Also he has in his employ a couple of well paid hard men who had no compulsions whatsoever about perpetrating a bit of brutal violence at their masters behest; Hamish Graham “The Cracker” (known for cracking skulls!) and Archibald McPhee (a bit of a practical jokester!). 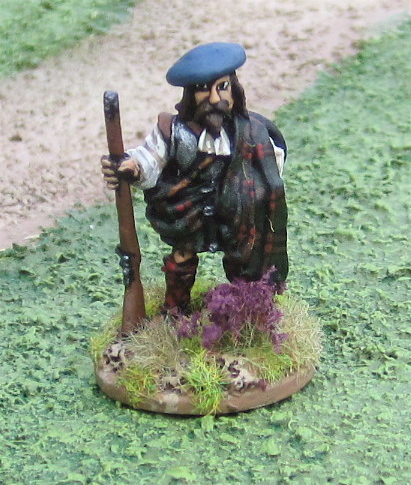 And, of course, every good Scots leader needs a piper to announce his entrance! For game purposes Robert and his crew will be fielded as a Forlorn Hope. With them will be a number of units of clansmen – a few of his FATHER’S men that had been put at his disposal. I might add in a unit of shot or commanded shot…? 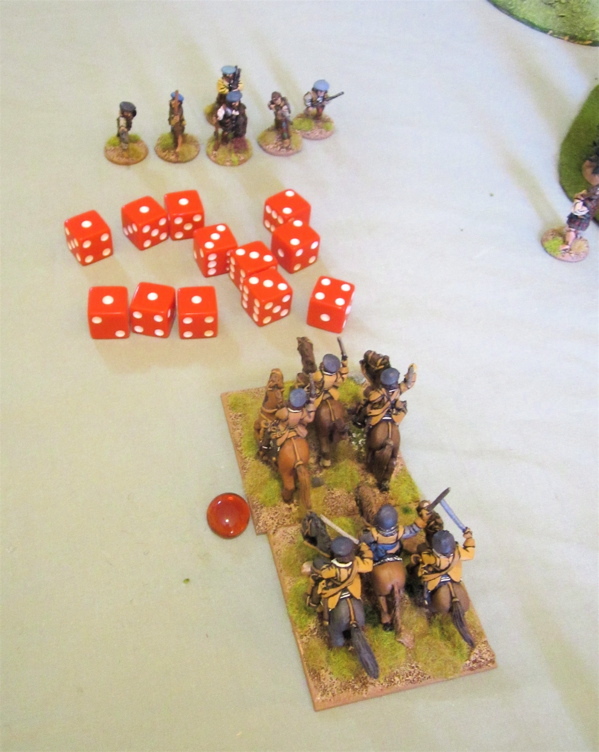 With the two units of clansmen and the Forlorn Hope I have 12 points worth of units – halfway to a standard 24 point force. Seems like a good place to start though, and add units as the force progresses through the campaign and Robert (hopefully) gains Honour! I could simply field the Forlorn Hope and SIX units of Clansmen. Unfortunately I only really have enough figures for four…. Unless I pilfer a few I had set aside to make a Scots Royalist DBA force… I might do that… otherwise I’m not sure how I’ll come up with 24…? 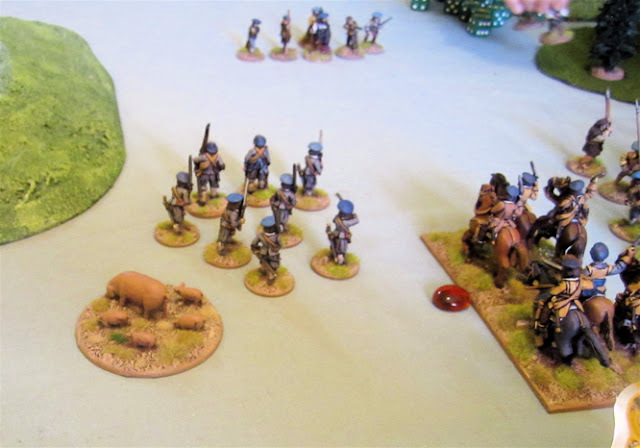 I do have some Irish I could add, but I had thought I’d field them as their OWN force… We shall see – young Robert needs to survive his first action, then perhaps we’ll start worrying about what to add to his force! Possibly a report of Robert MacRame’s first engagement against the government forces (what could possibly turn this fine capitalist, wannabe war profiteer against the potential cash cow of the government!?)…? Or perhaps an introduction to Robert’s soon-to-be nemesis Evan “Holy” McErrol – a dour Covenanter Commander and son of an even dourer martyred Calvinist Presbyterian preacher – with a hatred for the English and anyone who would support their king…? 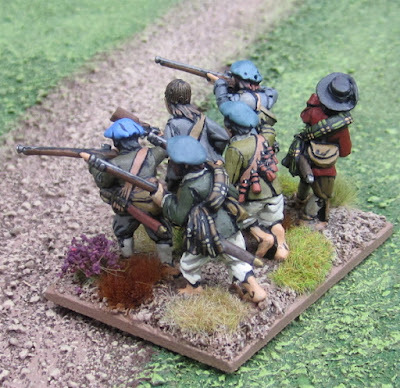 I have been working on some more post apocalyptic scavenger types for Mutants and Death Ray Guns and some English Civil War Irish for The Pikeman’s Lament. 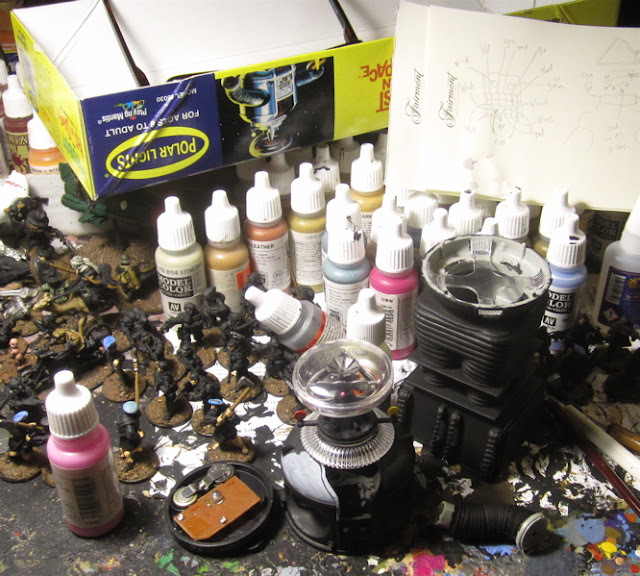 I will post them here after they’ve been featured in the Lead Painter’s League. 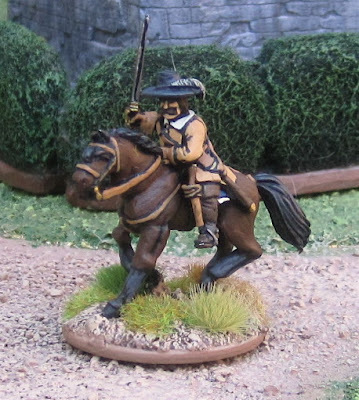 I also happened to finish up a solitary mounted cavalryman – which I will not be submitting as an entry into the League – which finishes off a unit of six for The Pikeman’s Lament (the other five were painted over a year ago…). I was planning a post to introduce some of the Dramatis Personae that will be involved in my upcoming narrative campaign for The Pikeman’s Lament. I have a little scenario I’d like to run sometime this week, hopefully there will be a report of that little action! Not happening this year. Sorry. I want to thank everyone that has commented on this blog and been so supportive of the project. Though time has been running short, that wasn’t really what killed it. 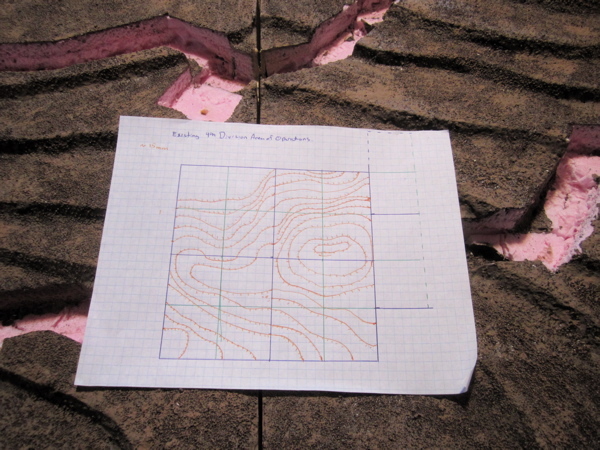 I probably could have gotten it done – though it might not have been as pretty as I originally intended. It wasn’t even the lack of enthusiasm – I could have worked through that. 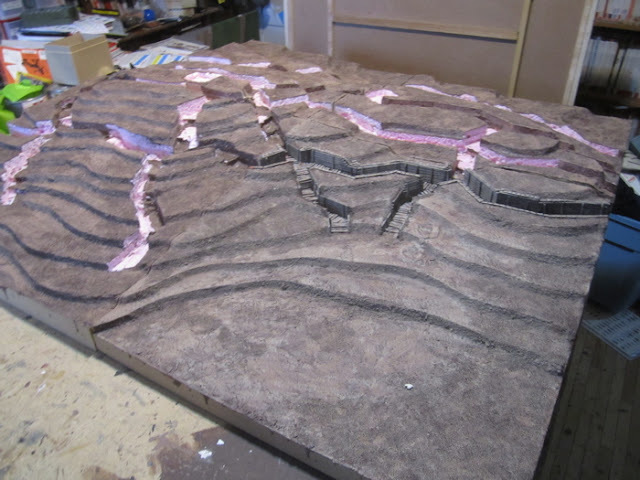 I sat down with my mostly finished plan and started pricing out the materials I’d have to run out and get to build the terrain and WOW prices of building materials have gone up since I last bought any in quantity! It was going to cost a LOT more than I’d originally budgeted for (and my original budget for the project was going to completely blow my year’s toys spending budget as it was). That was the final nail in the coffin. (Well that and the kitchen renovation that Amanda’s suddenly decided MUST HAPPEN THIS YEAR!!! But that’s a whole other story…). So it’s not happening for the 100th anniversary, which is a bit of a shame… Not saying it’s never going to happen. When I made peace with the fact that it wasn’t happening this year It felt like a great weight had been lifted off of me and with it the general disinterest and loathing for the project. I’ll return to this some day, but it’s not going to be this year. For now… I need to do something else. 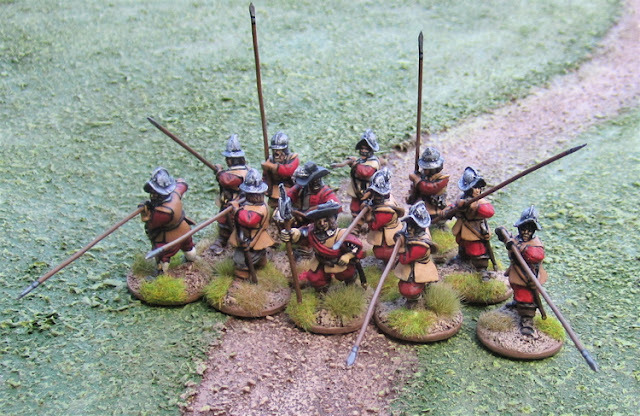 I’ve been working on some English Civil War figures to try and finish up a couple of companies for Pikeman’s Lament (and/or En Garde and/or Flashing Steel). 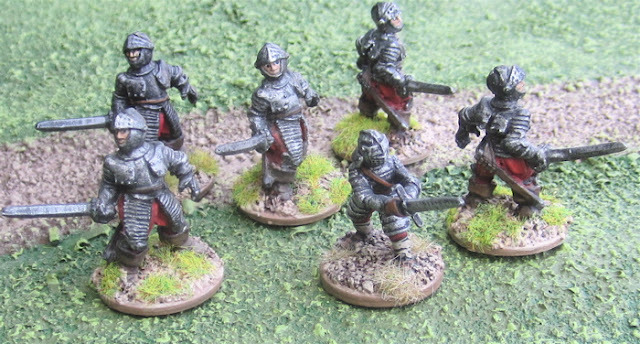 I’ve also been eyeing up my fantasy and medieval stuff and planning units for Lion Rampant/Dragon Rampant and Song of Blades and Heroes. Yesterday another package arrived from Magister Militum with some more Lead Adventure Post Apocalyptic figures (for some more Mutants and Death Ray Guns action!). And I guess since I won't be so insanely busy building terrain, we should get back to some BOARDGAMES! So, I’ll be keeping myself busy. It's also getting warm again this week (-1°C forecast for today and daytime highs above freezing for teh next week!) and i want to get out RIDING! They’re done – and with that I have finished all the miniatures I was planning to use for the project. I haven’t even bothered to post individual pictures of each battalion. I probably won’t. 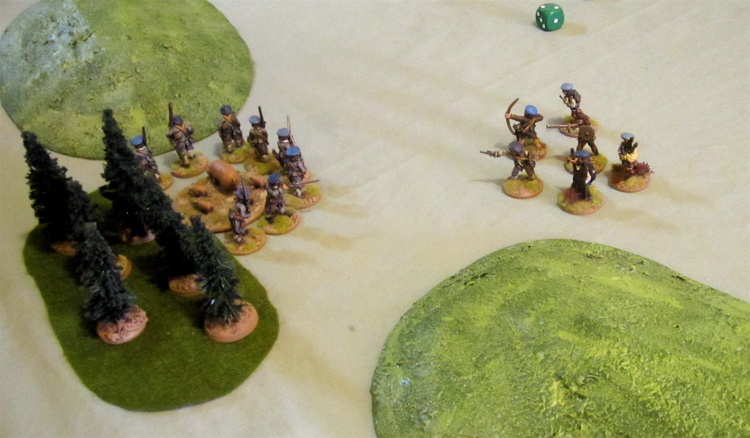 But I finished off the last three battalions of the 6th Brigade and 3 machinegun teams and 4 mortar teams. 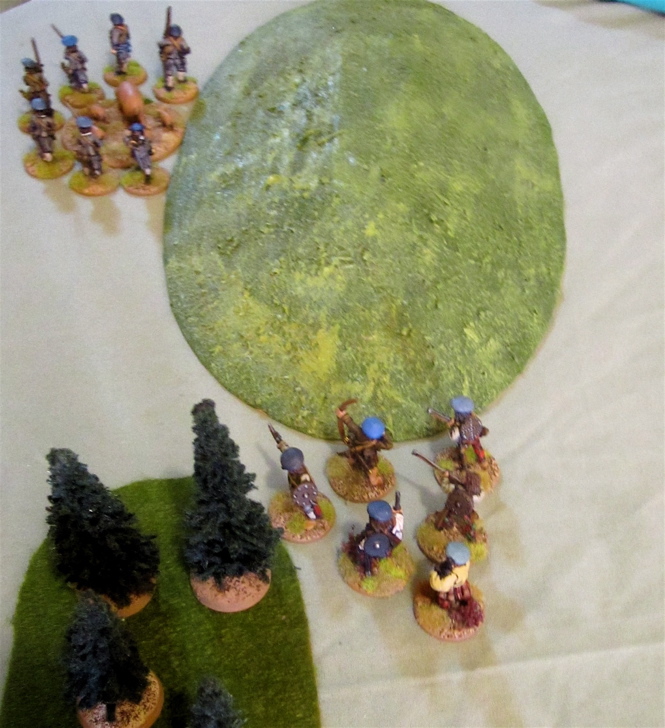 Just for giggles I thought I’d set out the entire Canadian Corps (so far… I don’t have the 10th Brigade done – as they did not take part in the action on the 9th as they were being held in reserve for an attack on “The Pimple” (as strong point just north of the ridge) the following day). And started trying to figure out how to tie it all in to the rest of the ridge. But I can’t in all honesty say I have “finalized” any sort of plans. If I’m going ahead with this, I best get on with it! At this point, I have to be honest, I’m sick to death of this whole thing. 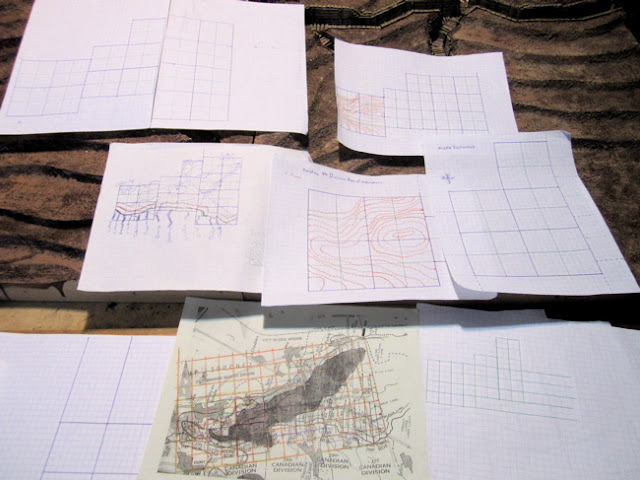 For some time I’ve just been going through the motions of trying to get it all done and posting updates on this blog hoping somehow I might get excited at that prospect and it might rekindle some spark of enthusiasm. On one hand I just want to throw in the towel and say “fü¢k it, it’s just not worth it anymore….” There are a hundred other things i'd rather be doing. But on the other hand I feel like I’ve put so much work into it and come so far, I should see it through, right? Alas the weather has taken a turn for the worse… we’ve has a few days of snow – and WIND – and the temperature has plummeted from +5°C into the -20s (°C). (or… maybe something completely different…).